The chickpea flour resulted in a fantastic cake-y texture and the flavor didnâ€™t overwhelm at all! I added vanilla rice protein powder for a little more of a protein punch. 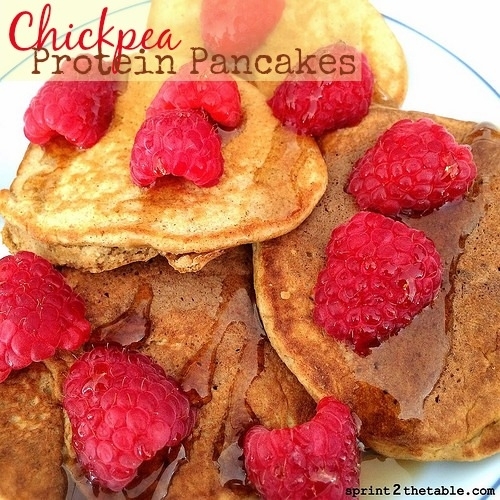 In a small bowl, combine the chickpea flour, protein powder, gelatin, baking powder, and cinnamon. Mix until combined. Whisk egg white with water. Stir into flour mixture and add sweetener to taste. To cook, pour 2-3 T batter into a non-stick skillet over medium heat. Itâ€™s time to flip when it begins to bubble. Cook until lightly browned. Plate and top as desired. I used sugar-free syrup and fresh raspberries.